In the noise, the temporary fence is taken away and huge structures appear. Noise permeates the building of these architectural monuments, and once built, they are as ugly as sin. The dying buildings are suddenly demolished by large machines and disseminate to nothingness on a gust of wind. They become industrial waste. Even buildings that have withstood the test of time vanish from the deepest corners of people’s minds. It is nearly impossible to remember what kind of building was there. Structures do not exist in human consciousness at all. Let’s think about it.Is it truly necessary to coexist with structures in a city environment, which eventually turns to rubbish, simply to sustain an economy oriented society? Is it possible for us to throw away everything, reconsider and start from scratch? No, we can’t People have become seduced by the illusion of living in peace even though they have little satisfaction . The time has come to throw everything away. We should create a system that allows us to build our utopia, free from the old concept of architecture. This is the new era of public consciousness : a revolution for the year 2000. If this change of consciousness is not complete within a few years, the new environment will never exist. We have to think about everything. Now. Every act. For us, our children and our future. The light broke at 11:02 a.m. on August 9, 1945. Dropped from 9,600 meters, it turned to light at 503 meters above ground. The atomic bomb fell on Nagasaki. My mother saw the southwest sky burn bright. Eighteen years later, in 1963, I was born and brought up in Nagasaki. When I　heard wartime stories in my childhood, the atomic bomb was never skipped. Light, bursting wind, heat wave, rain… It was beyond my imagination, but remember simulating scenes clearly in my mind whenever I heard the stories. Desert of desires. The words remind me of my childhood memories of what Nagasaki must have been like the instant the atomic bomb exploded. My memory is only a simulation of the unclear rays which my mother saw-eye-piercing bright light enveloping everything, and slowly melting the outlines of every-form. Each form turns into black spots. Only the white light remains in the end. Then with the same gradual speed, the light resumes time and diminishes its intensity to a slight mist. In the next moment, the earth-now a desert obliterated of all forms by the heat of the aftermath-appears. It is an image without morality. This image may be similar to that of a CNN news caster who described the Gulf War Scud missiles’ flash of light in the night sky as “beautiful.” Once ethics come into play, however, the initial response is no longer forgivable. It turns into fear toward the irreparable damage. I have never experienced war. My image of war is based on a college of information produced by mass media, and even these images only exist in my mind. Desire is the want of something and the effort to fill the need. To fulfill one’s desire one needs to destroy human ethics by some kind of force. It is not at individual will, but the will of a group such as a nation, religion, power structure, or polities. War is the act of fulfilling desire and it is a fear. War, for me is the dropping of the atomic bomb on Nagasaki and the light it emitted. The desire, then, turned into light-an irrevocable, scary light. The light gulped everything and look everything away. Living peacefully in a safe city, we tend to forget these scary moments, but some other fearful matter seems to be approaching us very slowly. Desire takes root when people do not pay attention and gradually deprives man of what is most important to him. These days, the ethics in fulfilling desire are watered down and fear itself is hard to come by. It is an artificial, safe existence and leads to the weakening of power for personal expression. Individual opinion is being consumed like a commodity. What we have to preserve is the environment, where we create and weave history. We should not consume it, but maintain it and pass it on. We should continue to acknowledge fear so that the light of fear, as a desire, is never seen again. 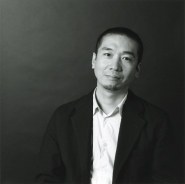 Yukiharu TAKEMATSU was born in 1963 in Hasami-cho, Nagasaki Prefecture. After graduation from Tama Art University (Dept. of Fine Arts, Architecture Course), he joined Unite Design & Planning Co., Ltd. In 1991 he established his own architectural design office under the name of E. P. A. (Environmental Protection Architectural Institute) and has started design activities based on the concept of self-sufficient architecture. Takematsu + E. P. A. have been working not only in the architectural world but also in the wide rage of domains including interior design, exhibition design, and product design. In recent years, Takematsu + E. P. A. are involved in an increasing number of environmentally friendly projects and are realizing the architecture as a device to convert the environment through the establishment of a wall greening system and the development of hybrid CLT (Cross Laminated Timber) made of local wood. Of late Takematsu + E. P. A. also founded a non-profit public corporation Incombustible Technology Research Association as they focus on large-scale wooden buildings, and are developing a fire resistant city consisting of wooden constructions. Awards: DFA Design for Asia Awards 2018 Grand Award, BCS Awards 2018, 2007 D&AD GLOBAL AWARDS and 2008 ASIA PACIFIC INTERIOR DESIGN AWARDS, etc.